What bout B2B ecommerce in Education? There is a very good description of this different on the web site of a Surety Bond Provider Lance Surety. Surety bonds are used in numerous industries, in order to make these business fields safer to do business. Bonds exist to safeguard the interests of the general public, and the authorities that regulate different trades. Since the terms “surety bonds” and “surety bond insurance” are both used to describe bonding, it’s easy to mistakenly think surety bonds are like insurance. In fact, these two forms of security serve completely different purposes. In the case of insurance, you and other insured entities contribute premiums on a regular basis, so that the insurance company will offer you compensation if you incur any losses that are covered by the insurance. Insurance protects you, and insurance companies mitigate the risks you are facing in return for your regular payments. However, surety bonds work differently. They are required from you or your business, to guarantee your honesty, performance, or abiding by certain rules, laws or regulations. Surety bonds protect parties that may be affected by your business, such as clients, subcontractors, or the state. You also need to pay a premium in order to get bonded, but if you fail to fulfill your obligations under the bond, you might get a claim on your bond. With bonds, the premium covers the underwriting and pre-qualification services costs. Thus, the entire risk stays with you as the principal. If a claim against you is proven, it is your responsibility to repay affected parties. Being bonded is a powerful sign for your customers and relevant authorities that you are safe to do business with. It boosts your business reputation, and sends a powerful message in marketing your company. Who needs to obtain a surety bond or insurance? What does being bonded vs being insured mean? 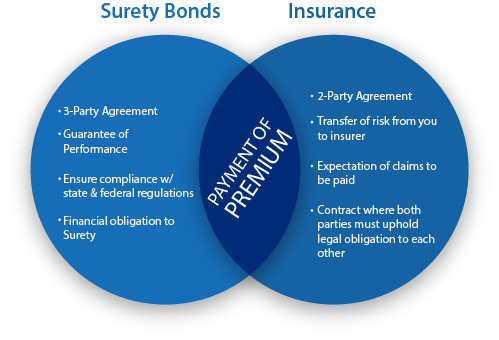 How much does a surety bond cost vs insurance? How are claims handled for surety bonds? What is a surety bond, then? There are usually three parties involved in bonding. There is a principal, which is you or your company, which is asked to post a bond by an obligee, which is usually a state or local authority. The bond is then underwritten by a surety provider who ensures that you will respect the contractual conditions set forth by the obligee. In order to get bonded, you don’t need to pay the full surety bond amount that’s required from you. You need to cover only a fraction of that, which is called the bond premium. Once you’ve covered that premium, you are bonded, which is similar to having an additional line of credit with a bank. Your surety backs your business by guaranteeing its lawful operation and successful performance. You can learn more about the specificities of bonding on our Surety Bonds FAQ page. Both surety bonds and insurance are required from a wide range of businesses, in order to compensate for risks in different aspects of their operation. They are both risk-management tools, but are used for different purposes. The most common professions that need to get bonded include auto dealers, construction contractors, freight brokers, telemarketers, and mortgage brokers, among others. Usually the surety bond is required as an essential element of their licensing process. That’s why auto dealer bonds, freight brokers bonds and contractor license bonds are some of the most popular surety bonds. Contract bonds are another type of commonly required bonds, which are needed for guaranteeing the completion and quality of construction projects. They are obtained on a project basis. As for insurance, its application is even more widespread, even when not required by law, to mitigate certain risks for individuals and companies. Most of the trades that require being bonded also include getting proper insurance, in order to operate in compliance. While both surety bonds and insurance guarantee financial compensation in the case of unforeseen events, being bonded means something completely different for your business than being insured. In many cases, businesses are actually required to obtain both a surety bond and a relevant type of insurance. For example, if you are a contractor who is duly bonded, in case you cannot complete a project that you’ve signed, the project owner can claim a compensation up to the penal sum of your bond for non-completion. The surety initially covers the claim costs, which you’ll need to fully repay. Surety bonds and insurance serve different functions, and are often used together to guarantee the safety and performance of businesses. As a contractor, you usually need to obtain workers’ compensation and liability insurance. Thus, if you cause damage to the property you’re working on, or there are unforeseen medical costs for your employees, your insurance will cover the costs. Because surety bonds and insurance serve very different purposes for a business, their prices are formulated in different ways. In the case of bonding, your surety bond cost is a percentage of the maximum penal sum that can be paid to affected parties on proven claims. Depending on the type of business you’re in, the standard bonding rates are in the range of 1%-5%. Bad credit applicants usually are offered premiums between 5% and 20% of the surety bond amount. The specific bond price that you will have to pay to get bonded depends on the bond amount required from you, as well as on your personal credit score, business financials and other financial and professional factors. The cost of your insurance, on the other hand, represents your regular payment to an insurance company in return for transferring certain risks that it takes responsibility for. Insurance companies determine your premiums based on the risk of providing insurance to you. Unlike insurance, in the case of claims on surety bonds, it is the bond buyer, or the principal, that needs to cover any proven claims. When an affected party files a claim, your surety conducts a thorough investigation. The claim can be brought to court if there are disputable aspects to it. In case the claim is proven, the claimant can be reimbursed up to the penal sum of your bond. At first, your surety covers the claim costs, so it ensures any affected parties are compensated for the mishaps or unlawful actions on your side. According to the agreements stipulated in the bond, however, you are then liable to repay the surety in full. I hope that this information was helpful. Thank very much Solomon! Really appreciate it! Before I ask my question on B2B ecommerce in Industrial Manifacturing you might want to provide an up date on the industry? Sure Virginia. Here is an interesting take on trends in industrial manufacturing to 2022 from a SAP related source. The industrial manufacturing industry is in turmoil, driven by business pressure, market trends, and new technologies. By 2022, industrial machinery and components (IM&C) companies should anticipate and plan for trends that will directly affect their viability and priorities. To identify the top IM&C trends, we considered all trends that are relevant to the lines of business R&D/Engineering, Sales and Marketing, Supply Chain, Manufacturing, and Aftermarket Service. According to the IDC, by 2020, 50% of the Global 2000 will see the majority of their business depend on their ability to create digitally-enhanced products, services, and experiences. Shift the revenue mix towards aftermarket service revenue by extending the service offerings portfolio (including IoT-powered service offerings), entering new markets, partnering with freelancers and other service providers for selected markets and products, and by providing aftermarket service for products of the competitors, including full service contracts. Driven by the customers of IM&C companies who expect the consumerization of B2B sales and simplified sales processes with consumer-grade buying experience, original equipment manufacturers will transition to true omnichannel customer engagements with digitalized sales processes. IM&C companies stretch their current business models to go beyond the classic value chain from the initial design to the final disposal, creating cross-industry networks to increase the operational efficiency across the entire asset lifecycle. “Digital twins to manage build and usage,” including simulation of the build phase, play a major role here, providing all asset information to all relevant parties, such as the vendors of the asset as well as to the customers, operators, and service providers. IM&C companies will offer pay-per-use as an additional business model for software and digital services, as well as for their machines and equipment. Equipment-as-a-service contracts for auxiliary products, as well as for products for their customers’ core business will become commonplace. As part of their industry 4.0 journey, manufacturing companies are leveraging plug and produce approaches to increase their agility in manufacturing, like bringing new machines to a manufacturing line on the shop floor with easier system integration. Smart plug and produce enabled products with edge intelligence will be an integral part of a self-optimizing, or lights out manufacturing system. IM&C companies are already equipping their products with edge technologies, IoT capabilities, and integrated machine learning technologies, and this trend will continue to grow over the next 5 years. Manufacturing companies want to leverage IoT technologies and infrastructures to provide new services for the sales and marketing line of business to increase revenue generated from products and digital services, drive new revenue from data and data-related services, as well as for the aftermarket service line of business, including an increased spare parts business, and also revenue driven from new professional services. According to the German Machinery and Plant Manufacturing Association, data-based business models will contribute more than 10% to the revenue of German manufacturing companies by 2020. Today that number is 3%. Over the next few years, more software and firmware will be embedded in products to provide new features and functionality, enable digital capabilities, or replace existing physical capabilities through automation. Industrial manufacturers will continue to leverage virtual reality and augmented reality in their daily operations, especially in field service management, where service technicians can use virtual and augmented reality technologies for guided repair in remote environments in certain countries or for particular products. Industrial manufacturers have begun to utilize machine learning algorithms, a key component of artificial intelligence, to leverage all available, valuable data sources and big data technologies to improve manufacturing planning and scheduling processes. Of course, there are many more important trends than the ones listed above, and some of them might make our top 10 list next year, or the years that follow, but for now, industry experts and some of our top customers are focusing squarely on the ones we have covered today.